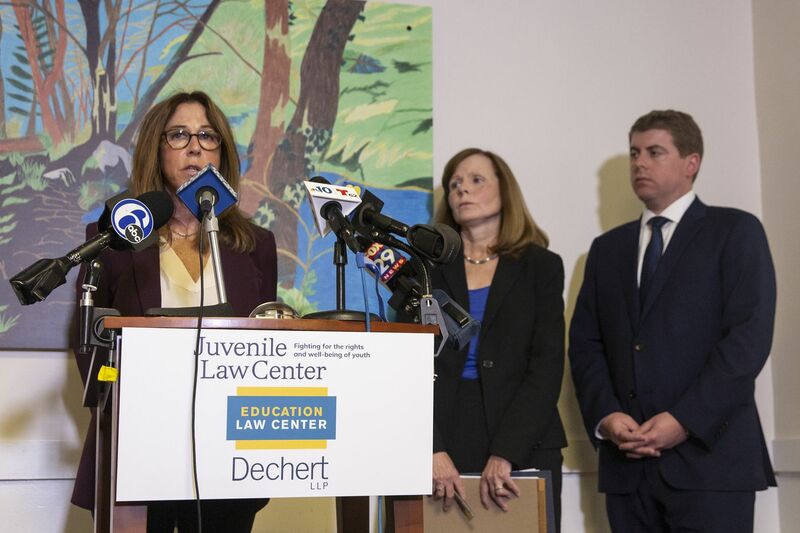 Marsha Levick, Chief Legal Officer of the Juvenile Law Center, speaks during a press conference along with Maura McInerney, center, and Michael McGinley, regarding a lawsuit against Glen Mills Schools and PA officials, citing abuse of children and deprivation of education, at the Juvenile Law Center office in Center City, Philadelphia on Thursday, April 11, 2019. A lawsuit filed against state departments, officials, and others on behalf of Glen Mills students suggests that the institution was not just a dangerous place for troubled young people to turn their lives around, it wasn’t even a school. The suit, filed Thursday by Juvenile Law Center, Education Law Center, and Dechert LLP, seeks financial damages on behalf of hundreds of young people who were sent to Glen Mills by the courts only to be physically abused and beaten. Notably, it also charges that students at Glen Mills were deprived of an education. Instead of being the “Harvard of reform schools,” Glen Mills was a place where, according to a series of Inquirer reports, kids were physically harmed. They were further harmed by deficiencies in the education provided. The suit claims there was little in-person instruction or support from qualified teachers. High school education was relegated to students reviewing a GED book. The suit asks for educational compensation for students who were deprived. The suit sends many messages, among them, that physical violence is horrific. But depriving a child of an education is another form of abuse. The suit also is notable because it underscores that responsibility for the failure of Glen Mills, which was closed by the state earlier this week, falls not just to the administration or its employees, but to an entire system. The Pa. Department of Human Services (both its current and former secretary) is cited for failing in its oversight role, as is the office of Children, Youth and Families. The state Department of Education and its secretary are named for the failure to evaluate or consider the quality of education provided to the children at Glen Mills. The obvious but meaningful message: When one institution is accused of failing children, we should look for a failed system. An unasked — and unanswered — question is why do we often do such a lousy job of protecting children? Too many children who are part of closed and opaque cultures that can form in a school, a residential facility, or a church are at especially high risk for damage — from the very places where they should find safety. That’s why serious reform of such centers as Glen Mills is overdue. So is reforming the approach we take when dealing with young people. And Glen Mills isn’t the only place. A report by the Education Law Center recently indicts residential centers throughout the state that deal with both dependent and delinquent young people. The report, “Unsafe and Uneducated,” found a “shocking lack of oversight and accounting” in the state’s residential care system. When the state separates a child from his or her family, it has a singular responsibility to ensure the child’s protection. Many other states have started serious reform, especially when it comes to incarcerated youth. The Justice Lab at Columbia University this week launched Youth Correctional Leaders for Justice, which will advise state and cities on closing youth prisons. Pennsylvania should take note. Robbing our most vulnerable and troubled children of their dignity and their future should be considered a criminal act.